The book chronicles the plight of the environment and the Lorax, which speaks for the trees against the greedy Once-ler. Bobbie Anderson Gee, Lila & Bill Senter, Sydney & Evelyn Niblo, Carolyn & Harwell Barber,Callie & Lee Hampton, Miss Brooke Miers, Julie & Buddy Napier, Robert (Bob) & Ardis Gillette, Lynn & Carl Roeder, Donna & Chester Dougherty, Jane and Bob Milstead, Tom Taylor family in memory of Eileen Taylor Massey, Marilyn Ann Caldwell, Senter Realtors, In loving memory of Jimmy Farrington, Scott & Jill Bishop, Pete & Martha Hinman, Grandchildren- The Berry’s, Logan, Sam, Abby, Tom, Wes, Will & Brook, John R. & Jana Thacker, Honoring Sam Morford, L. Glenn Cummins, Arrow Ford, T & T Family Foundation, Joe Ed Canon, In honor of Paige & Lola from Pat & Ralph McCleskey, Hunter’s Texas Stone, Abilene Reporter News, The Children of Abilene ISD, Wylie ISD, St. John’s Episcopal School & Abilene Christian Schools, Fehr Foods, Inc. – Subsidiary of Grupo Nutresa, Junior League of Abilene, Lauren Engineers & Constructors, The City of Abilene, The Crowe Group, Inc.
“Yertle the Turtle,” king of the pond, stands on his subjects in an attempt to reach higher than the moon – until the bottom turtle burps and he falls into the mud, ending his rule. The main character of “How The Grinch Stole Christmas!” is a cold and heartless green recluse who tries to sabotage Christmas for Whoville, only to find the true meaning of Christmas. Sam I Am is determined that an unnamed character in the book should try green eggs and ham whether it is in a boat or with a goat or here or there or anywhere! The Cat in the Hat entertains two small children on a rainy day with wild hijinks. This book is one of the best-selling children’s books of all time. Art Atchinson Aimesworth, his sister Esther and Spaulding Littlefeets sail to the North Pole in this sculpture depicting a scene from the William Joyce book. Location: T&P Depot, 1101 N. 1 st St.
Tsar Lunar, the very first Guardian who watches over the dreams of the children of Earth. A philosophical warrior rabbit skilled in martial arts, E. Aster Bunnymund is one of William Joyce’s Guardians of Childhood. Family Vision Associates; Dorothy Preston, O. D.; Steven Ezzell, O.D. ; Darren Postelwait, O.D. Location: 1201 N. 1 st St.
One day on the farm, Duck gets the wild idea he can ride a bike. After riding past the other farm animals, they decide they want to try bike riding too. Location: National Center for Children’s Illustrated Literature, 102 Cedar St. Everywhere David goes, he seems to get in trouble. But he always has an excuse. After thinking about his mistakes, David decides it’s time to say he’s sorry. Before he was St. Nick, he was a daredevil named Nicholas St. North. Now he’s a Guardian. 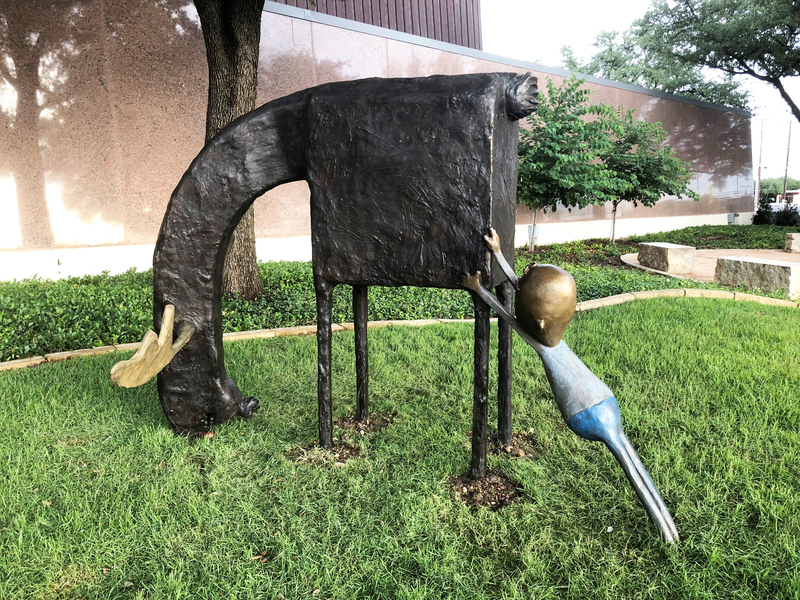 The sculpture was created for the 20 th annual Outdoor Sculpture Exhibit and depicts the William Joyce character, Dinosaur Bob, playing with an orange Volkswagen. Location: Abilene Public Library, 202 Cedar St. The Guardian of Fun can manipulate snow and ice. Jack Frost is known for his role in the animated movie “Rise of the Guardians” in which he assists the other Guardians in battling Pitch, the Nightmare King. The Seymour character, who is a boy made of beads, is hidden on every page of Wick’s “Can You See What I See?” book series. This former captain of a shooting star is the Sandman, the Guardian of Dreams. Her Serene Royal Highness, Toothiana, Queen of the Tooth Fairies, is also a Guardian of Childhood. She fiercely guards the teeth she collects because they contain children’s memories. With a few simple lines of verse and some hilarious illustrations, parents are ready to put their youngsters to bed. But in this book, the youngsters are dinosaurs. Mama Cat is not happy when her three little kittens lose their mittens. Unless they find their mittens, they shall have no pie! Adventure follows this mouse wherever he goes, from sailing a boat in Central Park to saving a friend from Snowball the cat. Three little pigs with three different houses all encounter one big, bad wolf! Charlotte weaves astonishing words into her spider’s web to save her best friend, a pig named Wilbur. Three bears return home to find someone sat in their chairs, tasted their porridge and laid in their beds and that someone is Goldilocks! Marcel has trouble following Wilfred’s rules, such as going where the boy wants to go. Perhaps because Wilfred’s pet moose doesn’t quite realize that he belongs to anyone.